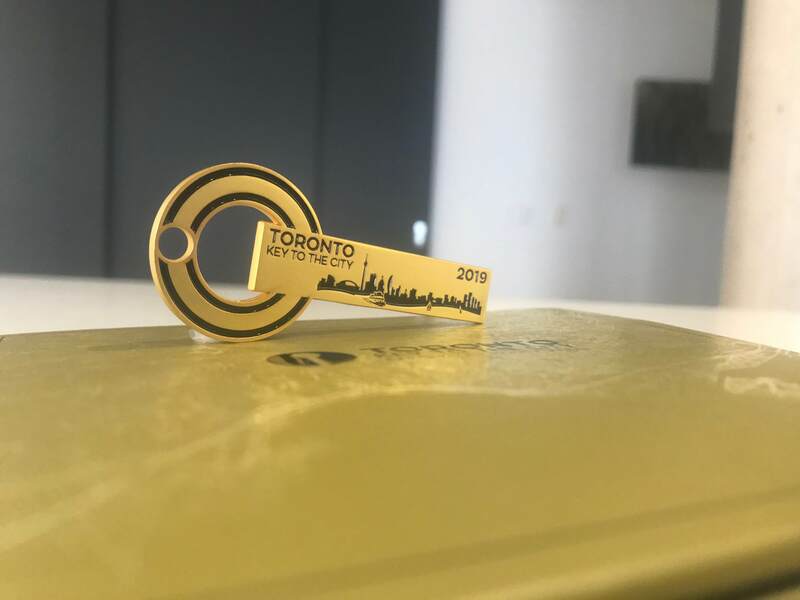 Toronto Key To The City Instant Loyalty Rewards for key-holders at Toronto restaurants, nightlife, entertainment, spas, hotels, shops and tourism. Order the Toronto Key To The City with 3-city access to 225+ valuable VIP loyalty benefits at only the best, curated partner restaurants, nightlife, spas, entertainment and more. Show the Toronto Key for exclusive VIP loyalty-love all year long. WHAT IS TORONTO KEY TO THE CITY? Toronto Key To The City is a VIP loyalty benefits program. The physical gold Key is shown, and tapped to verify, when you visit the best of the city’s restaurants, nightlife, spas, entertainment and more. Each curated partner business then gifts something valuable and exclusive to Keyholders on every visit doing business with them. VIP benefits include complimentary welcome appetizers, off-the-menu items, complimentary drinks, spa and hotel upgrades, VIP skip-the-line access at restaurants and nightlife spots, savings on travel and entertainment and more. It’s all about loyalty returned, in a uniquely VIP fashion, all year long. 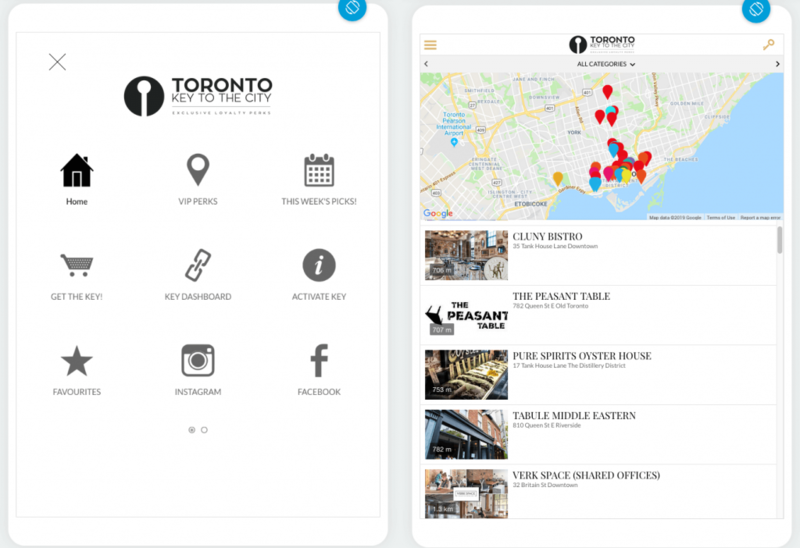 Toronto Key To The City partners with only the best of each category and genre for restaurants (pubs / casual / upscale), nightlife, spas, hotels, entertainment, shops, services and more. Our curation team ensures we have the very best and unique finds across the city. VIP benefits include complimentary welcome appetizers, off-the-menu items, complimentary drinks, spa and hotel upgrades, VIP skip-the-line access at restaurants and nightlife spots, savings on travel and entertainment and more. It’s all about loyalty returned, in a uniquely VIP fashion, all year long. And if that wasn’t enough, the Toronto Key also gets you access to all VIP benefits, in all sister cities we have, including Vancouver and now Montreal. Our mobile app is popular with many features to help you get the best out of your Toronto Key To The City. Search by category, genre, district and nearby VIP benefit partners while on-the-go. We also geo-fence partner locations so you get reminders that will ping your phone when you near certain locations to remind you of VIP benefits that await you. This has been far and away one of our most popular features. Our recent #TorontoKey Soirée for media + influential event at Figures Restaurant was a smash success. Attendees learned more about Toronto Key To The City and our plans moving forward! The evening featured passed culinary delights by the talented Chef Ron Stratton, signature “Superhero” themed cocktail inventions and a live belly dance + sword show performance. Thank you to all for the ❤ and who helped make the Toronto Key To The City season kickoff event such a phenomenal time! Keyholders enjoy some very VIP loyalty love benefits whenever dining here throughout the year; A must-experience! Get your limited-numbered Key, while they’re still available a little while longer, by clicking here.